Global Travel Media » Blog Archive » IAPA Au Pair Of The Year 2016 Winner Announced – High Above The Atlanta Skyline! IAPA Au Pair Of The Year 2016 Winner Announced – High Above The Atlanta Skyline! A heart-warming cultural exchange success story was revealed at the WETM-IAC 2016 Celebration Dinner, amidst stunning views of the Atlanta, Georgia skyline. 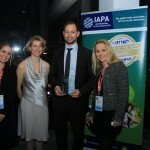 The 12th edition of the IAPA Au Pair of the Year Award has been awarded to German-born Robert Isemer. He was nominated by his host family, the Thurman’s, after spending a year with them in Vienna, VA, USA. Placed by agency American Professional Exchange PROaupair, Robert is a highly deserving young man who has shown just what a positive life-long impact an au pair can have on both the host family and their community. 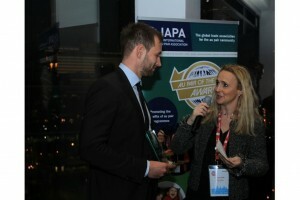 Robert was presented his award by International Au Pair Association (IAPA) newly appointed Chair, Delphine Vaills. Robert is a true ambassador for what best practice au pairing should be. Undaunted by caring for ten-year-old Alex, a funny and curious boy with a rare syndrome and autism, Robert helped Alex to gain more independence and flourish. The Thurman’s said, “Robert was an extremely active participant in Alex’s schoolwork, researching and implementing new methodologies to help him integrate better in to general education and better comprehend and retain the curriculum, resulting in impressive grade improvements! Robert even volunteered at the school and attended educational conferences on his weekends to better support people with disabilities”. 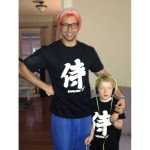 “When Robert left our family and community, he had even managed to impact our health and nutrition, guiding us to healthier eating habits, sharing typical national recipes with Alex’s grandmother, studying for and receiving his CrossFit Instructor Level 1 Certification and making lifelong friends in our local community”.